Shiden* was young and full of optimism for the future when he was imprisoned for his Christian faith. For the next 13 years he was exposed to torture of different kinds, including months in a very small cell in solitary confinement, and even his eventual release failed to bring about the future he had hoped for. Now, Shiden hardly sleeps. Since his release from prison, he spends most nights fighting the despondency that covers him like a blanket. Shiden became a Christian when he was in his late teens. His older brother John* had become a Christian earlier and was chased out of the house when their father found out. John was never allowed to return until their father died, but after he moved back home again, Shiden also became a Christian. He knew it was a dangerous decision. 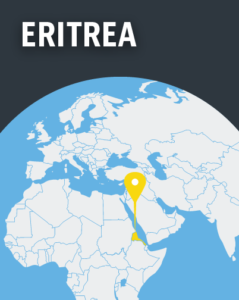 Eritrea’s society is deeply suspicious and antagonistic towards evangelical Christians and the government imprisons those who belong to religious groups outside the three mainline churches or Sunni Islam. Shiden had heard the stories of the terrible suffering of Christians in prison but he decided the risks were worth taking. 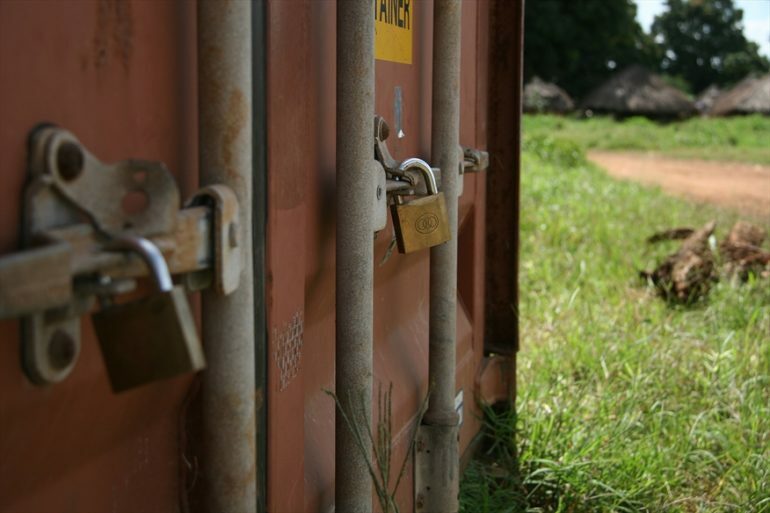 One day, during his military service, when he was 22, he and around 40 other Christians were caught while worshipping in secret. They were all arrested and taken to a military prison in the southern desert city of Assab, where it is extremely hot during the day and extremely cold at night. After two years there he was moved to the notorious Mai Serwa prison camp on the outskirts of the capital, Asmara. There, Shiden shared a metal shipping container with 30-40 other prisoners. They were given one ten-minute toilet break per day, to be undertaken in a bush outside, where they had to relieve themselves under the close watch of guards. The lack of sanitation caused regular bouts of diarrhoea. A while later they moved Shiden to the general prison in Barentu, 250km west of Asmara, where he remained for the next ten years. He was often put in solitary confinement for six months at a time, staying in a very small cell where he couldn’t stretch out his arms or even stand up straight. One day, out of the blue, Shiden was released from Barentu and sent back into national service. But even there, Eritreans continue to live as virtual prisoners, as they are watched all the time. The same was true for Shiden. Guards and spies kept a watchful eye on him. What did he talk to others about? Did he pray? Did he have a Bible with him? It wasn’t long before the spies noticed that Shiden had a few sections of the Bible that he hid under his blanket. The guards destroyed them and placed Shiden in solitary confinement again, for three months. During that time he saw no-one. Once a day, a cup of tea and a slice of bread were put through a gap in the door. He had no idea if anyone even knew what state he was in. He said it was a horrifying experience and that, to make it worse, just beforehand he had heard that some friends had managed to escape and cross the border. After his sudden freedom, Shiden’s family soon discovered that his release after so many years didn’t solve everything. Returning to normal life was not easy for Shiden and neither he nor his family was prepared. First, there was the trauma. He told his brother John about some of the things that had happened to him, bringing him to tears. Shiden had been imprisoned when he was 22, but came out as a 35-year-old. Though he had survived his ordeal, a return to normal life confronted him with the fact that he had missed out on education and job opportunities. His hope for the future had been eroded. He said his brother’s situation is far from unique and that there are thousands of Christians suffering like him, having been in prison for different lengths of time. John said they all “face similar challenges when they come out of prison … and we have to think about how to support [them]. I dream of the day that Shiden will be healed and find hope again”. Eritrea ranks as the 6th worst nation in the world in terms of Christian persecution, according to Open Doors’ 2018 World Watch List. In 1997, the Eritrean government ordered all religious groups outside of the Eritrean Orthodox Church (EOC), Roman Catholic Church, Evangelical Lutheran Church and Sunni Islam to apply for registration with the Department of Religious Affairs. The Presbyterian Church, Methodist Church and Seventh-day Adventists applied, but 20 years later, they are still awaiting a response. In 2002 a law was passed prohibiting Churches other than the Orthodox, Catholic and Evangelical Lutheran, and also Sunni Islam, each of which is now tightly controlled by the state. 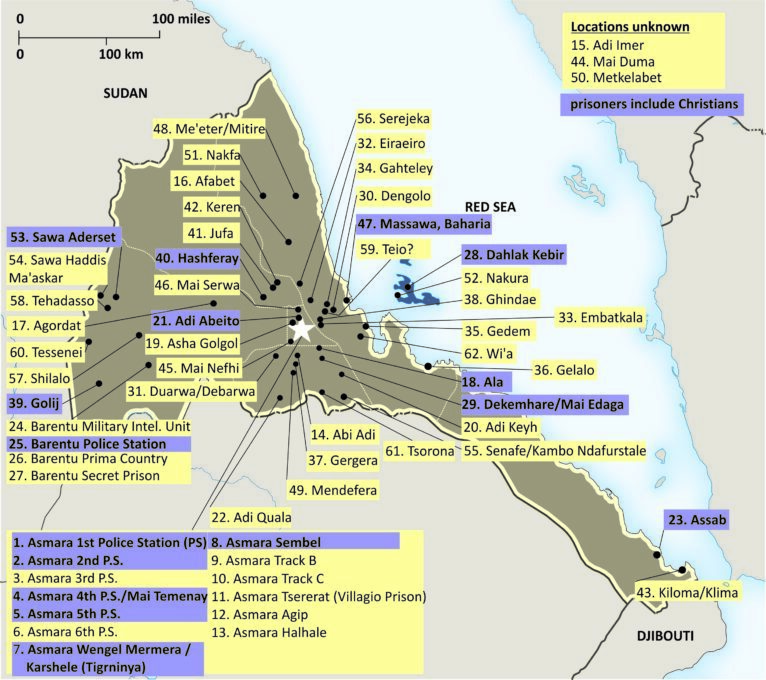 Thousands of Christians from non-sanctioned denominations have been thrown into prison in one of Eritrea’s many prisons. The graph above shows a list of detention facilities in the country, using information from the UN Commission of Inquiry. Those marked purple are prisons where Christians are known to be held.